DOHA, Qatar, 2018-Apr-17 — /Travel PR News/ — After expanding its highly-successful sponsorship of the ABB FIA Formula E Championship earlier this year, Qatar Airways this weekend celebrated its partnership in Rome where the airline was represented as the Official Airline Partner of the 2018 CBMM Niobium Rome E-Prix presented by Mercedes EQ, held on Saturday 14 April. After much anticipation, the CBMM Niobium Rome E-Prix presented by Mercedes EQ arrived on the city’s streets last week with a 1.76 mile track between Cristoforo Colombo and the Palazzo dei Congressi. As Official Airline Partner, Qatar Airways hosted a lounge inside the Allianz E-Village, where families and sport enthusiasts were able to take part in a variety of activities, including a photo booth with fun pictures to share on their social media channels and other competitions. Qatar Airways Group Chief Executive, His Excellency Mr. Akbar Al Baker, said: “After an exciting Formula E season last year, Qatar Airways is delighted to have renewed our partnership not only as title sponsors for the E-Prix in Paris and New York, but also as Official Airline Partner to the Rome and Berlin events. As part of a new three-season deal, announced in Doha in January this year, Qatar Airways reaffirmed its continued title sponsorship of the Qatar Airways Paris E-Prix, which this year takes place on 28 April, as well confirming the title sponsorship of the Qatar Airways New York City E-Prix on 14 and 15 July. 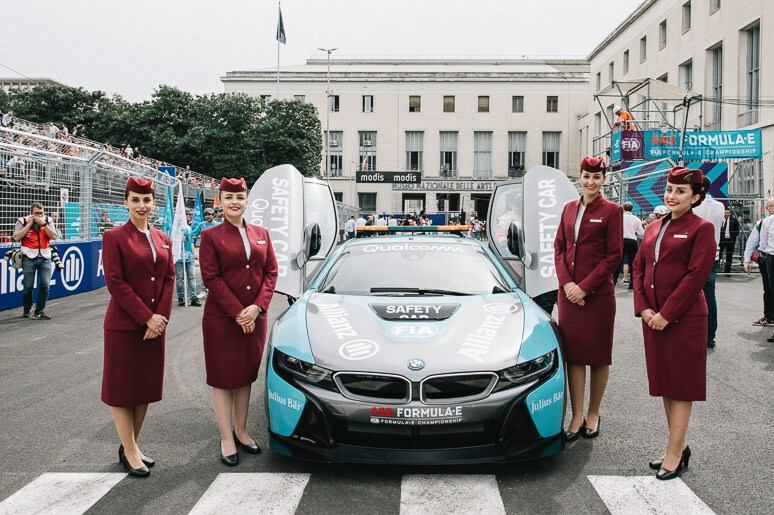 The enhanced partnership also revealed Qatar Airways as the Official Airline Partner to the exciting events that unfolded in Rome this weekend, alongside the Berlin E-Prix, on 19 May this year. Qatar Airways believes in the power of sport in bringing people together, thus sponsors many top-level sporting events around the world. As well as sponsoring Formula E, Qatar Airways is also the Official Airline Partner of FIFA, which includes 2018 FIFA World Cup Russia™, the FIFA Club World Cup™, the FIFA Women’s World Cup™ and the 2022 FIFA World Cup Qatar™. Qatar Airways proudly flies one of the youngest fleets in the sky, featuring the world’s most technologically-advanced and environmentally friendly aircraft. The airline operates a fleet of more than 200 modern aircraft to a network of more than 150 key business and leisure destinations across Europe, the Middle East, Africa, Asia Pacific, North America and South America. The airline is continuing its ambitious expansion plans, and will launch a host of exciting new destinations this year, including Cebu and Davao, Philippines; Langkawi, Malaysia; Da Nang, Vietnam; Bodrum and Antalya, Turkey; Mykonos, Greece and Málaga, Spain. As well as being voted Skytrax ‘Airline of the Year’ in 2017 by travellers from around the world, Qatar’s national flag carrier also won a raft of other major awards at last year’s ceremony, including ‘Best Airline in the Middle East,’ ‘World’s Best Business Class’ and ‘World’s Best First Class Airline Lounge. This entry was posted in Airlines, Entertainment, Festivals and Events, Sports, Travel, Travel Management, Travel Marketing and tagged 2018 CBMM Niobium Rome E-Prix, His Excellency Mr. Akbar Al Baker, Mercedes EQ, Mr. Alejandro Agag, Qatar Airways. Bookmark the permalink.